Luma Sleep makes a bed that we really like. Before we tell you why, here’s some background about Luma. They are a Florida-based mattress manufacturer. It was created with guidance from “The Sleep Doctor,” Michael J. Breus, PhD. They have a lot of options but you should know that it’s a latex based bed and comes in 3 firmness levels. This is a premium bed and it’s reasonable but a little higher priced than some other bed in a box brands but with the quality it’s a great value. If you are looking for an affordable monthly payment you can get 0% financing if you pay within 6 months. Plus, you can get a Luma Mattress discount. Just use code LUMA10 for an additional 10% off (or give your email address on the website for 10% off). 2. Comes in 3 Firmness Levels that Can be Exchanged For Up to a Year! What you’re going to love is that this bed give you choices. You can choose ‘Plush’ (3.5), ‘Medium Firm’ (6), and ‘Firm’ (7.5). You have up to a year to exchange the top layer to fit your preference too! We’ve found that addresses the #1 reason people return a mattress – it’s too firm or too soft. 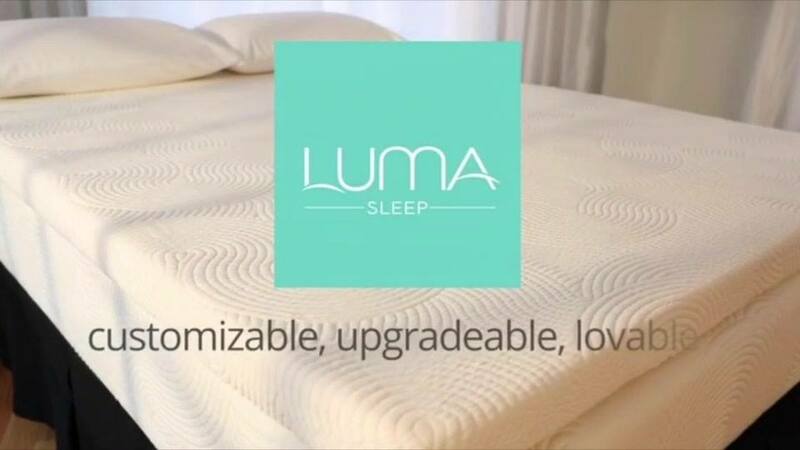 Luma addresses this and gives you plenty of time to be sure you have the firmness you sleep best on. And with the exchange you can find the firmness level that fits your preference. The basic Luma mattress comes is an exception – it just comes in 2 firmness levels. The mattress can be exchanged for the other firmness level for up to a year after purchase. The Latex Hybrid Slumber System has a 3″ topper can be exchanged for a different firmness level for up to a year after a purchase. The All-Latex Slumber System includes …a 3″ Talalay latex topper in your choice of 3 firmness levels. The system comes with 2 queen size Talalay latex pillows, a mattress protector and free white glove delivery. The topper can also be exchanged for a different firmness level for a year after a purchase. 3. Luma is a Heavyweight! You may think of a heavy bed as a negative but it’s actually a plus! It might be harder to move this mattress but here’s why that’s a good thing: weight is a sign of quality. Cheaper beds use light weight foams that aren’t going to last as long. It might be easier to move a lighter bed but you’ll have to replace it more often. This mattress should last twice as long as most of the top brands you’ve heard of. 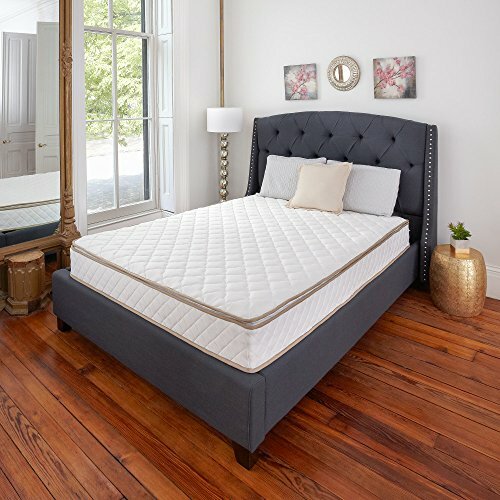 If you’re in the market for a new mattress, like natural latex and want to buy from a solid company that is transparent, recommended and makes their beds in the US, Luma is a great choice. Combine that with the firmness level exchange, 0% financing and quality, Luma will make even the pickiest sleepers happy. 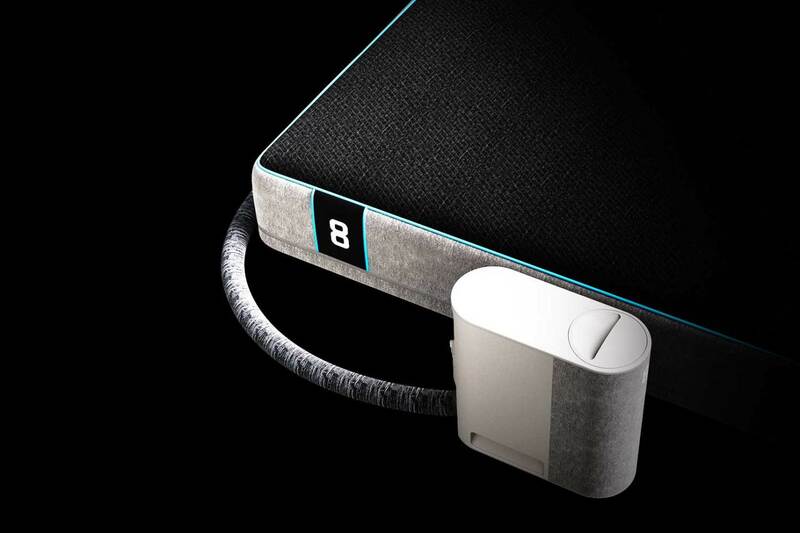 Eight Mattress is already the most high tech mattress we know. Today they announced a new mattress that will automatically adjust to your body temperature. It’s called the Eight Sleep Pod. It’s not a nap pod or something that encloses over you. This high tech mattress uses liquid embedded into the layers to regulate the temperature. We haven’t seen anything like it! The company says they used 43 million hours of sleep data, insights from over 30,000 sleepers and says they collaborated with 5 leading sleep researchers to come up with the Pod. Unbox Mattress may earn a commission on your purchase of a Pod. Pod tracks your sleep and learns the right temperature for you. Features personalized temperature regulation on each side of the bed. Temperatures can range between 55° and 115°F so it’s ideal for any climate. The Pod is the only bed that dynamically adjusts its temperature to be perfect for you all night long. It monitors your sleep patterns, learns your temperature preferences and cools and heats to keep you comfortable. There are sensors in the 4 layers of foam and it’s a liquid based thermoelectric system. During the night the bed keeps you at thermoneutral or to your settings. Best of all, if you sleep with someone, both the dynamic temperature and biometric tracking work independently for each side of the bed. That means one side can be cooled (for example, if she has menopausal symptoms such as night sweats) and the other side could be neutral (so he doesn’t freeze while she tries to stay comfortable). In addition to helping you sleep by getting the temperature just right, the Pod can act as a thermo alarm to wake you up gradually and naturally, without the sound of an alarm. It gradually cools the bed in the morning and can adjust the temperature to help you fall asleep at night. Eight uses the data to give you tips to help improve your sleep. Connects to your smart home through Amazon Echo, Google Home, Nest, and Philips Hue. Prices start at $1,995. Pre Order only. Reserve with $95 deposit. Shipping begins April 2019. Fast, easy financing is available, including at 0% interest (should you qualify). DreamCloud luxury hybrid mattress – (read our DreamCloud review) one of our top picks if you like a bit firmer mattress – announced two new products: Luxury Percale Bed Sheets and contoured memory foam pillow. This is the first bedding the company has offered. Note: we may earn a small commission when you shop through our links. Made from 100% long-staple organic cotton that’s extra soft and super strong. Made to fit a deep mattress like DreamCloud’s which is 15″ deep. 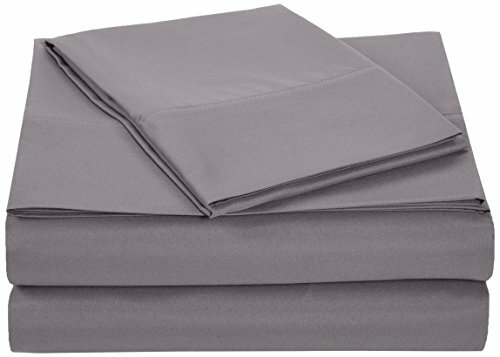 The pocket fitted sheet features elastic corner bands and will fit any mattress 12” or deeper. 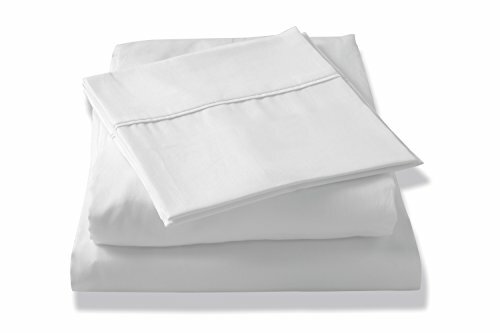 Perfect if you like crisp, lightweight and breathable sheets. Retails for $99 for a queen. Colors: white or dove grey. 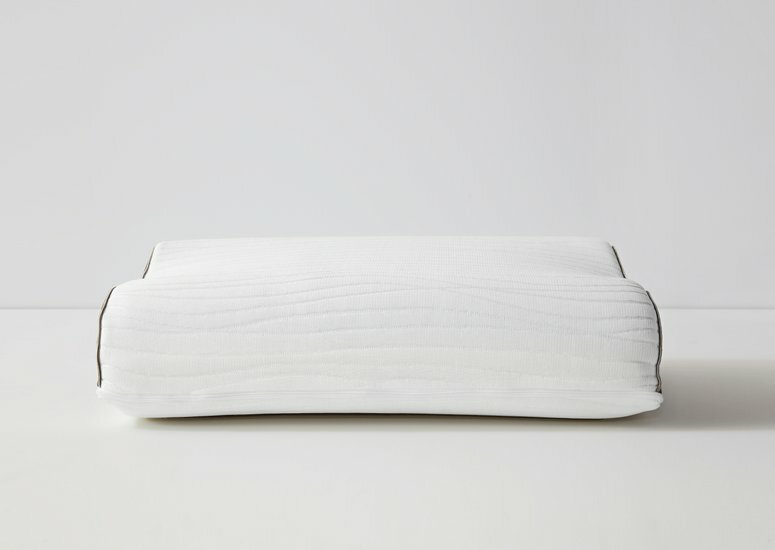 We really love that DreamCloud chose a contoured pillow – to add support. Ideal for anyone with neck pain. Also, we’re fans of adjustable pillows and are happy that DreamCloud pillows come in king size. Adjustable height, moisture wicking, contoured pillow. Sleep on the cool side with DreamCloud’s new pillow. Helps your body maintain the ideal temperature and features internal ventilation, a cool gel coating, and a cool knit outer cover. Wicks heat and moisture while you sleep. Choose exactly the right amount of height by adding or removing premium memory foam inserts in the pillow. Removable cover can be machine washed on gentle cycle with cold water. Line dry and do not bleach. Both the DreamCloud sheets and pillow come with a 100 night trial with free shipping and returns. Quick, easy online financing is available through Affirm (you may qualify for 0% interest). GhostBed has a new mattress in their line of memory foam beds. The GhostBed Flex hybrid mattress is a luxurious 13-inch deep mattress with 7 layers, including memory foam, foam and coils. Flex is GhostBed’s third mattress and joins the original GhostBed and GhostBed Luxe. The GhostBed Flex features a pillow top, is softer than the other two options and is the only bed they sell that has coils. Both the Flex and Luxe are 13-inches deep. It’s difficult to keep the two models straight, because you’d think the softer, higher end model would be called Luxe, but it’s the Flex. The Flex is the most plush mattress GhostBed offers and comes in between a 4-5 on a 1-10 scale (with 1 being a marshmallow and 10 being cement). At the time of writing, a queen Flex Hybrid is $1485, which is $210 above the Luxe. GhostBed Flex has 7 layers, including 8 1/2” tall individual coils for support. 1. Cooling Topper – GhostBed Flex’s top layer with advanced cooling technology. 2. 1” of Cooling Fiber – A layer of cooling comfort is woven into topper to aid airflow. 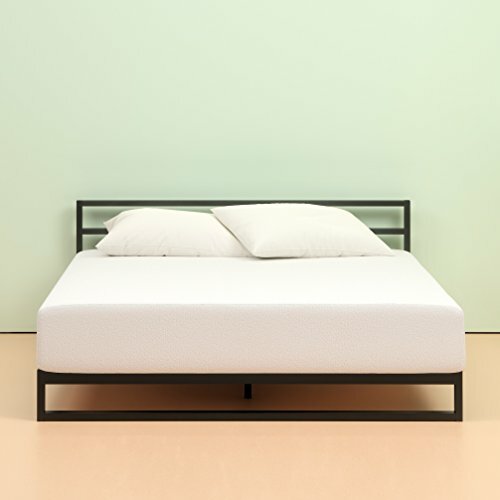 GhostBed, GhostBed Luxe, and GhostBed Flex are made without ozone depleters; formaldehyde; PBDEs, TDCPP or TCEP (“Tris”) flame retardants; mercury, lead, and other heavy metals; and phthalates. GhostBed products are low VOC emissions for indoor air quality. GhostBed features a 101-night sleep trial. If not completely satisfied, GhostBed will arrange for the return and give a full refund. Before we get into our favorite feather and down pillow, check out this holiday promo. Pacific Coast is a classic feature pillow company that supplies pillows to many hotels like Hilton. That’s where I first discovered it. Note: we review quality mattresses and bedding products and as part of that may earn a small commission from any sales. And if you stay in a hotel or experience their pillow they’ll even help you pinpoint exactly what pillow you slept on. If you’re like us and check brand names of your favorite bedding when you’re traveling! The Resilia® feather filled inner pillow delivers firm cushioning that keeps your head from sinking to the mattress while the exterior is made of fluffy down to cushion your tired head. Pillow can be machine washed and dried for easy care. What Pillows Does Hilton Use? Pacific Coast is the brand I discovered when I stayed at a Hilton hotel for a conference. The pillow was so soft and dreamy that I checked to see what it was. I normally don’t sleep on a feather and down pillow but this one was so soft and comfy that I loved it! This company has been making feather and down pillows since 1884! This is a classic feather pillow and they make everything from affordable pillows to higher priced luxury pillows and bedding. The pillow I checked was 75% down. This one is 100% – check out their down hotel pillow. Whatever you get, protect it with a pillow protector and it will stay cleaner and last much longer! Hotels may use a smaller pillow case (2″ shorter) to plump up the pillows and make them appear fluffier. Hotels sometimes use 2 pillow protectors on each pillow to reduce air flow to the pillow to keep it fluffier throughout the night. Hotel pillows are slept on and washed regularly which makes them get softer faster. You may need to wash and dry your pillow a few times to get the same effect. Pillows from hotels may be made especially for that hotel. You can look at the label and get as close as possible. They have to last as long as possible too, so the price may be higher. Hotels know that when you have guests asking all the time if they can buy your pillows (or are stealing them), then you know you have selected the right pillow. Now you can buy a hotel pillow and get that hotel stay feel with a Pacific Coast pillow. It’s one of our top picks and what we sleep on at home! 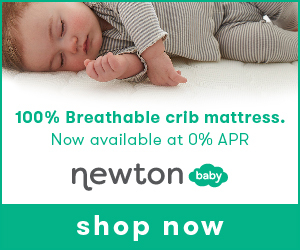 Need a new mattress now but want to pay for it monthly? You can buy online and pay as you go with most brands. They give you a quick answer and many times you won’t be charged interest. We finance a phone, our car, why not our mattress? Sleep is so important to our well-being and health it makes sense. Mattress companies don’t typically make money from financing, it’s simply a way to facilitate a bed purchase. Be sure to choose accessories such as: pillows, sheets, mattress protector and/or base or anything you need to go with your mattress. Many boxed mattresses use Affirm. Wonder how Affirm works? We walk you through step by step with screenshots so you can see the process before you commit. If you’re simply looking for the lowest monthly payment and you don’t have credit, have low credit, or don’t want your credit report pulled AND want your bed immediately, Helix is your best option. They make buying a bed within reach for anyone. The mattress companies that let you buy now and pay later with online financing options (like Affirm). Here’s our giant list of mattresses and what financing options are available. We may earn a commission at no cost to you should you shop through our links. 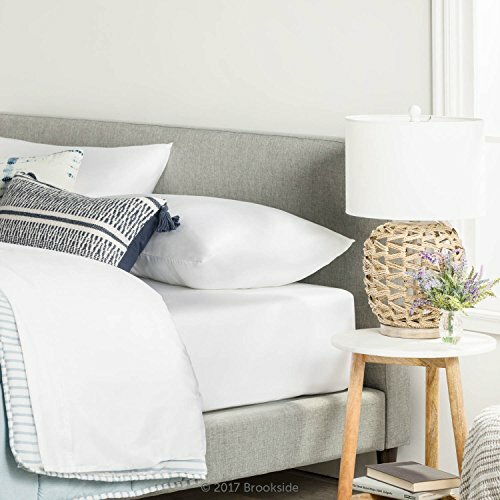 Brooklyn Bedding – Pay over 3, 6 or 12 months with financing rates between 0%-30% APR. Uses Affirm. Casper (use code UNBOX50 to save $50). Helix Mattress – many options to choose from, including split firmness. Financing through Klarna 0% APR if paid in full within 6 to 12 months. Or Zibby alternative financing for people with low or no FICO scores. No credit required, can be approved for up to $3,500 without looking at your FICO score. Hyphen Mattress Financing available via Paypal Credit. No Payments + No Interest for 6 months. Kaya Mattress – no details given. 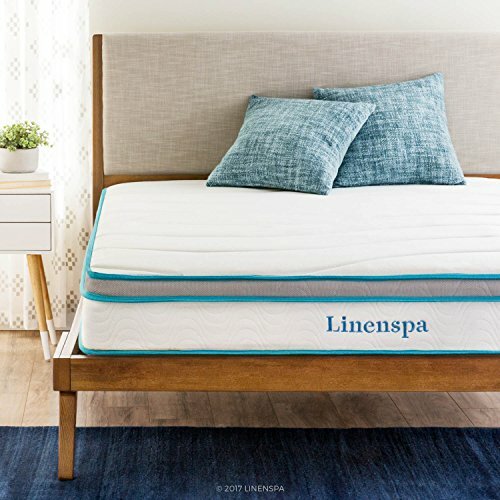 Linenspa – affordable memory foam mattresses. Comes in full sizes. No financing options listed. Loom & Leaf – high end luxury mattress with financing through Klarna. Luma Sleep – latex mattresses. No Payments + No Interest if paid in full in 6 months on purchases of $99 or more. Nest Bedding – uses both Affirm and Zibby (Zibby offers alternative financing for people with low or no FICO scores). 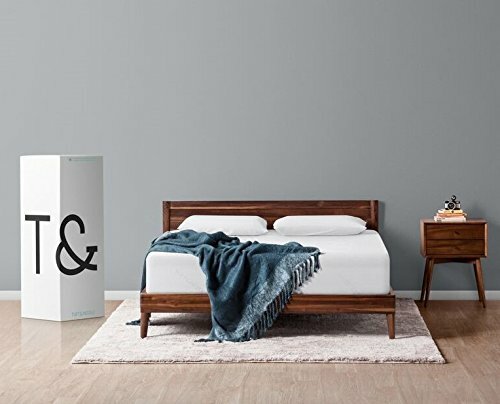 Molecule Sleep – high end athletic recovery mattress, starts at $61/month with Klarna. Muse Sleep – comes in soft, medium and firm. DOES NOT offer financing at this time. Mvmnt Mattress – high end, ulta luxury recovery mattress with interchangeable layers and high quality materials sourced worldwide. See video of mvmnt mattress delivery. Comes in extra large king size, called the Titan. Must call for financing options. 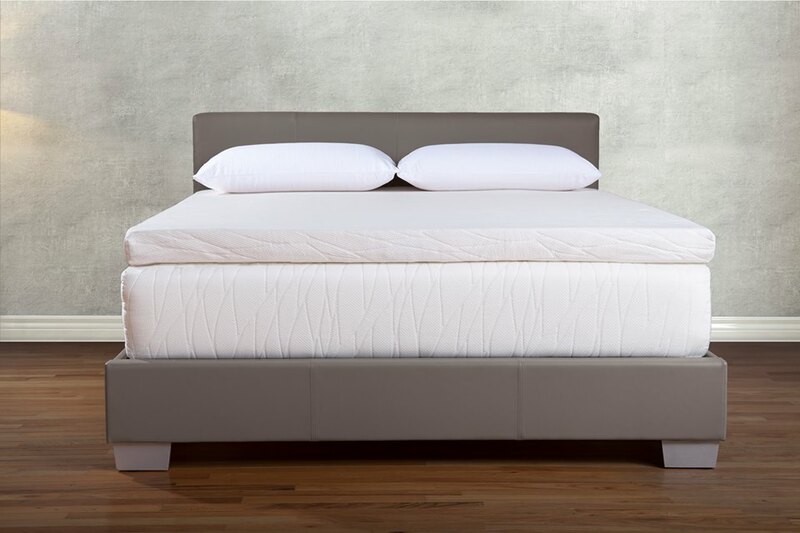 Pangea Bed Copper-Infused 100% Pure Talalay Latex bed – uses PayPal credit, starts with 0% interest. Solay Mattress starts at $39 a month with Partial.ly (according to website) but when we went to the buy page it had PayPal or Amazon Pay. Sweetzzz Mattress – they use Klarna and offer the longest no interest financing we’ve seen, based on total amount spent. Offers several firmness level. The Futon Shop – organic futon mattress. Lists monthly cost with each mattress so you can easily see the payment amount. Uses Affirm. Tochta – Rv or custom made mattress. WinkBeds – firmer beds offered, starts at $200/month with Bread financing. Zotto Bed – can pay with PayPal, no financing listed. A lot of people ask us about the Purple mattress and want to know – Is the Purple mattress really that good? Is it worth all the hype? To us, YES, it really is that good! But we must qualify our review. Keep reading for the must-know facts about Purple beds to help you decide if it’s best for you. Of the 1 star reviews, several were hearsay “My cousin said this…”,”I read a report that said …”. Several mentioned the ‘white powder’ that has been claimed to be bad for you – even though the material used on purple mattresses has been used in hospital grade beds for the past 20 years and the material is food grade. There is bias on both sides. Everyone has a unique sleeping style and preference. We’ve learned that one person’s firm is another person’s too soft. Generally speaking, Purple is in the middle, maybe towards the firm side. The best question to ask is, do you want your mattress to sink in and feel enveloped by it some? If you love that classic memory foam feel for your bed, Purple won’t be the best fit for you. It has no memory foam. You don’t sink in very much at all. WHAT DOES IT FEEL LIKE TO SLEEP ON PURPLE? All Purple mattresses have the comfort grid that you can sort of feel it through the cover (but you’ll stop noticing after a few nights). Overall though the mattress collapses around your shoulders and hips but not everywhere else. Hence, the famous egg test. With a Purple mattress, you can press an egg down onto the mattress and it will be absorbed inside rather than break. Other beds have a solid top layer and the egg pressed onto it would break. Because your movement is more isolated rather than all of your body sinking in, you can feel a little bit like you’re suspended on the mattress – floating almost. Purple truly does sleep cool because the grid and design allow for airflow. It’s not a solid surface. All those notches and designs mattress manufacturers use don’t compare to simply having open cells where air can easily pass through. Consumer Reports agrees and named Purple a top pick in their tests. It won’t sleep warm. HOW IS THE MOTION TRANSFER? We think Purple has exceptional properties for couples who keep each other awake because they shift around and move at night (or get in/out of bed). You’re not going to feel it as much with Purple because the flexible comfort grid is like a shock absorber that prevents movement from travelling through the bed. This is a favorite feature of people who love this bed or pet owners who don’t being woken up at night when their beloved pet moves around. Purple is a fairly new company still and it’s tough to know. However, we have no body impressions at all after 3 years. This is with 2 people sleeping on Purple, one being over 230 lbs and 6 feet 4 inches tall. The other is around 150 lbs. and 5 feet 8 inches tall. Again, that’s tough to predict but you’ll spend a lot less on a Purple mattress than comparable brands so you can afford to replace it more often as needed. Previously the company made the gel used in their mattresses for other applications (in shoes, golf bags, backpacks, etc) and it held up extremely well. So we have reason to believe that a Purple bed will hold up too. Eventually everything breaks down but we hope to get 10 or more years from ours. HOW DOES CONSUMER REPORTS RATE PURPLE? Purple (this is for the original) was rated in the top 10 of foam beds. Honestly, we would rate it much higher. WILL I LIKE PURPLE MATTRESS? Just like the commercial says, if you don’t want to sink in and overheat while you sleep, you’ll probably like Purple. If you have back pain and other issues like that, Purple is extremely comfortable. If you wake up your partner or if your pet wakes you up at night, you’ll like Purple. The cover zips off and you can wash it (though we highly recommend a mattress protector). Purple has the original mattress that’s 9.5 inches high and the newer models that vary by which you choose. The newer ones have springs but the original ones don’t. If you try a Purple you have 100 days to decide what you think. Unless you’re in pain, give it at least a month. It’s a unique feel and it may take some time adjusting to it. If you’re anything like us, you will adjust and end up loving it. If not, they’ll have someone pick it up or you can donate it to charity for a full refund. Is it Normal For Mattress Sizes To Be Off By a Few Inches? Over the past year we’ve seen a few instances of discrepancies in mattress sizes. There are published sizes that the industry goes by, however they do not always conform exactly. This isn’t only for boxed or newer brands either. Traditional brands can vary by several inches too. It’s considered normal if it’s under 2 inches. If it’s more than that you can request a discount or return the mattress. Note: there is also some variation in brands and how/where to measure from. Queen bed in a box mattress. Off by 3 inches in length. This one was 2 inches off on the width and 3 inches off on the length. Often customers will say, it didn’t fit my frame which is essentially the same thing as saying it’s not the correct size. Some will actually measure the bed. Also, most frames are made to account for variations. I know this because we have a twin xl mattress on a twin bed frame. The twin xl is 2 inches longer than a standard twin. However, it fits just fine and we can’t tell. If you buy a platform bed you won’t be able to notice but you can more easily switch between king/cal king, twin/twin xl, etc. or deal with the dimensions being somewhat off. These are reasons mattress dimensions might not quite matching up to company specs. It can be the result of a number of situations. Manufactures must stay with restrictions imposed by Fed-Ex and or UPS and some try to squeak by but get caught shipping larger. The box manufacturer doesn’t hit the size exactly but the specs aren’t changed on the sites. Manufacturers want to make their boxes seem smaller so they incorrectly list the sizes. From our perspective it’s usually not intentional nor is it consistent. Mattresses from the same brand undergo manufacturing changes (not large enough to tell you). Many times we notice variations – it’s not a standard across the board shorting of width or length of a bed. Some fluctuation on the measurements is pretty normal. Depending on how much exactly, and which dimensions are affected it could be considered a warranty issue. Have you noticed a size discrepancy with your new bed? If so, what did you do about it. Let us know in the comments. Unbox Mattress utilizes affiliate links and may earn a small commission on any purchases we recommend. The quality and type of mattress you have can mean all the difference between a good night’s sleep and a restless one. The type of sheets you have too can affect your comfort level. And even after waking up refreshed, it’s frustrating to wake up with bedsheets that have popped off the corners. We all know that sheets come in twin, full, queen, king. But these terms aren’t always a one-size-fits-all. Choosing the right sheets depends on the type of mattress you have. Mattress toppers can make a difference too. Even if you know which size to get, then there’s figuring out the best sheet material. It can get overwhelming. Read on to find out more about how to buy the best bedsheets for your mattress type. Before you select a standard sheet size, you need to get out a measuring tape and get the exact measurements of your bed. Most sheet measurements include just the surface–the width and height. But if you have a deep mattress or thick toppers, then finding the best bedsheets means including the depth. A typical twin bed measures 38 inches wide and 75 inches long. A twin XL mattress has the same width as a standard twin but is 80 inches long. Many college dorm rooms have twin XL mattresses. However, these mattresses can be thinner, so a standard twin mattress might fit anyway. Many colleges will have the mattress measurements available on their website. When picking out the best bedsheets for a twin, make sure the fitted sheet is 39 by 75 inches (or 80 inches for an XL). The flat sheet should measure 66 by 90 inches, which will work for either type of twin mattress. A full or double bed measures 54 by 75 inches. If you’re a tall person, you’ll either need to sleep on a diagonal or move up to a queen. The fitted sheet for a full mattress should also be 54 by 75 inches. The flat sheet measures 81 by 96 inches. A queen is not only wider than a full but also longer. Standard queen beds are 60 inches wide by 80 inches long. Flat sheets for a queen measure the same. The flat sheets measure 90 by 102 inches. Many people believe that a king bed is the same as two twin beds put together. In fact, it’s the same as two twin XL beds. That’s what makes them such a popular choice for a split king adjustable bed where each person gets the mattress they want but they can be paired to move together or separately. A king bed is 76 inches wide by 80 inches long. 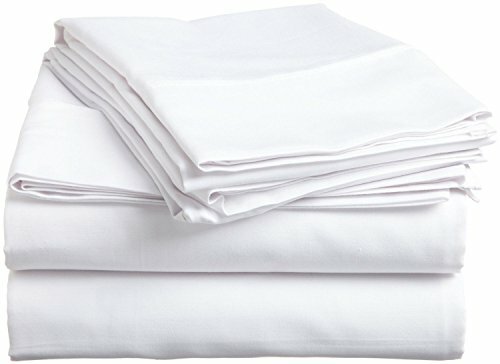 Fitted sheets are 78 by 80 inches, and the flat sheet is 108 by 102 inches. Some people prefer beds that are a bit longer. In that case, a California king is a wise choice. They measure 72 by 84 inches. It’s not as wide, but a few inches longer than a standard king. This is important to know when buying bed sheets. Regular king sheets won’t fit on a California king mattress. As mentioned, the height or depth of a mattress can also make a difference when picking out the best type of bedsheet. If a mattress is extra tall, or if you have a thick topper, then you might want to go up a size for the fitted sheet. Most boxed mattresses are 7 to 10 inches in height. But some can be as much as 16 to 22 inches high. If you have a mattress that’s more than 12 inches, then you need to find a fitted sheet that has deep pockets or sheets that are stretchy (like Purple’s sheets which fit mattresses from 9 inches up to 14 inches in height). Pocket depth varies too. So be sure to get a sheet with the appropriate pocket depth. It’s always better to err on the larger side. Otherwise, your sheets will slip off the mattress. Most experts agree that cotton is the best fabric for bedsheets but it depends on how you sleep. There are a lot of other options out there that claim to be extra soft. But if they’re made of synthetic material, including polyester, rayon, and microfiber and they can be good for athletes or anyone who sweats a lot because they’re super absorbent. Synthetic material is durable, is often stain resistant, is sometimes wrinkle-free, and claims to be softer. However, it doesn’t breathe, and that can be bad for your skin, and also the environment. Tencel is a great option that’s better for the environment. It’s made from fibers of eucalyptus trees which are renewable. Bamboo can be good or bad for the environment depending on how it’s made. Plus, it’s softer than most cotton sheets. The most luxurious sheets we know of are better than a 4-star hotel. They’re made in England and they’re 600 thread count and can fit up to 19 inch tall beds. They’re the BRAND OF SHEETS THE QUEEN OF ENGLAND SLEEPS ON and bear the royal seal. They’ve been manufactured by the same company since 1861. These are the sheets we sleep on. They’re pure luxury and make you feel like royalty. Check them out here. 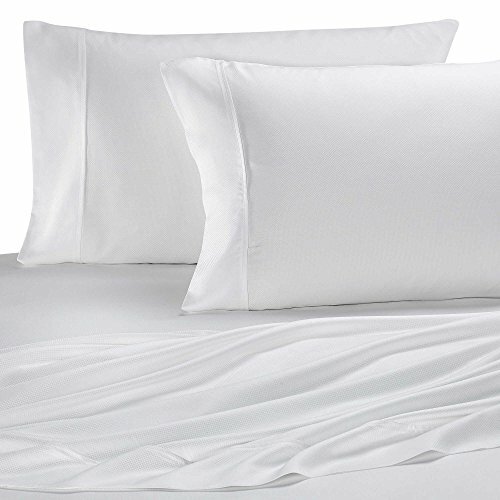 If you want to save money, go for a cotton blend, but be sure that the sheets are mostly cotton, at least 70%. When buying cotton, the type of cotton you choose is a matter of preference and budget. 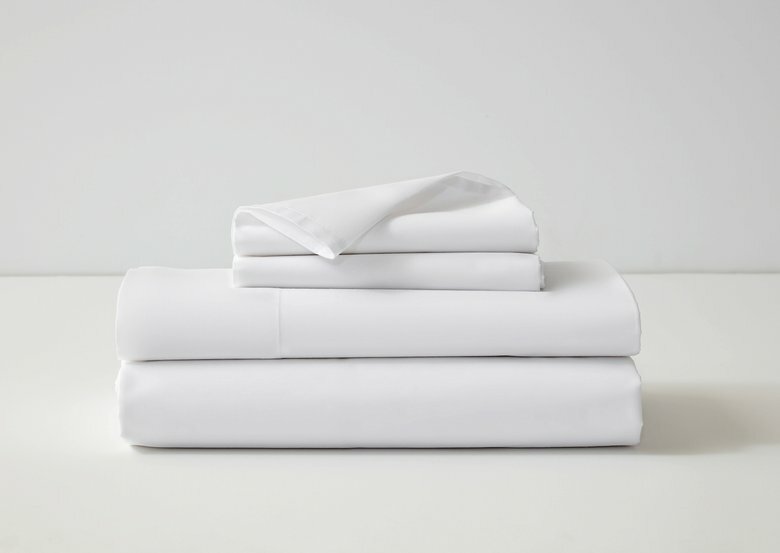 Egyptian cotton is the highest quality sheet material, followed by Pima cotton. 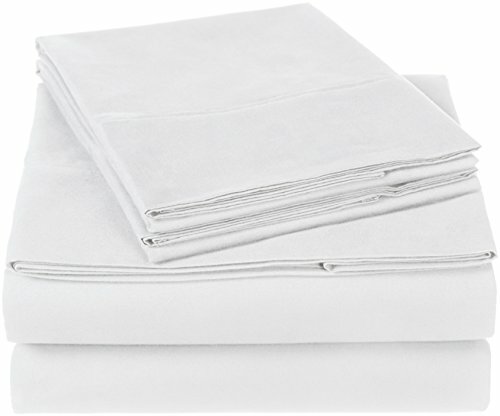 Organic cotton sheets are free of chemicals. If you don’t buy organic cotton, then be sure to wash your sheets before using. 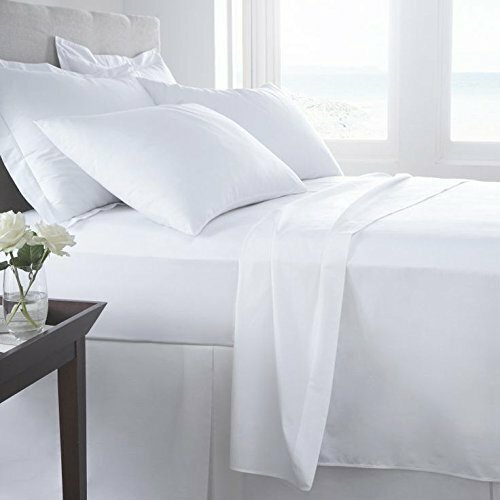 Cotton sheets go by a variety of names–percale, sateen, linen, flannel, and jersey. They all have different assets. For instance, flannel sheets are a good choice for the winter. They tend to stay warm because of their thickness. The quality of flannel sheets depends on the ounces of material per square yard, instead of thread count. A good flannel sheet will have four or more ounces. Jersey knit is also a good winter sheet option. But be sure to check the fine print. 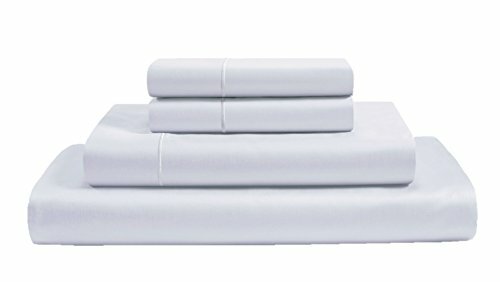 Some jersey cotton sheets are not 100% cotton, and some are. They tend to be affordable but don’t always last as long as flannel. For summer, many people prefer linen sheets. Although they don’t come with high thread counts, they are breathable and absorb moisture, which is great for warm summer nights. 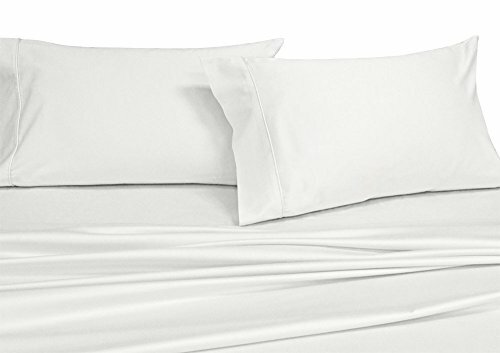 For any time of the year, either percale or sateen cotton sheets are great. 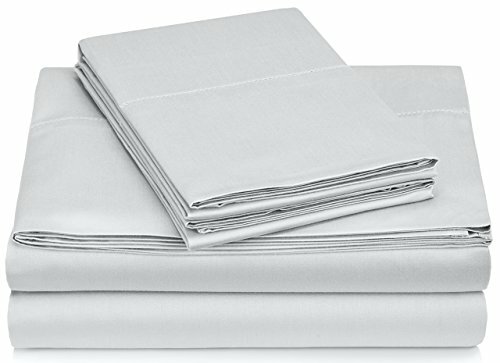 Percale sheets have a tight weave and are soft and durable. 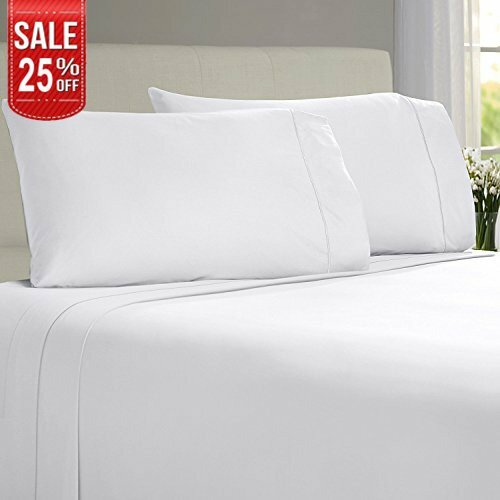 Sateen sheets have a special threading that gives them a luxurious satin quality. Many people are under the impression that the higher the thread count the better the quality. Thread count, when indicated, means the number of threads per square inch. A higher thread count is denser, so the fabric is heavier and more durable. But that doesn’t mean softer. Sure, you want to get at least 200 thread count, but more than 800 is overkill. What’s more important than thread count when choosing the best bedsheets is the quality of the fiber. 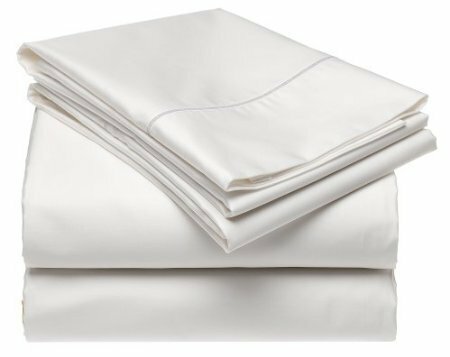 To sum up, the best bedsheets to buy are 100% Egyptian cotton organic percale sheets that have a thread count of at least 200 and the right pocket size to fit your bed. But you have some flexibility in regards to what kind of cotton and what kind of knit, fiber or weave. It’s a good idea to have a breathable sheet for the summer and thicker sheets to keep you warm in the winter. Finally, be sure to have a few sets of sheets that you love so that you can change your sheets every week. Once a week is ideal, but every two weeks is fine. If you aren’t in the habit of changing your sheets that often, here’s why you should. For more articles about creating the perfect bed, visit our blog. Consumer Reports recently answered a question that we’ve had for years – what’s the best mattress to sleep cool? So far we’ve seen a lot of promises but not a lot of performance when it comes to cooling products. Except the Bed Jet which blows cooler air into your bed, we don’t find many cooling products that work. Even special fabrics or cooling gels haven’t given us great results (but a higher price tag). That goes for pillows, sheets, mattress protectors and mattresses. So rather than a cooling mattress or cooling mattress cover you should focus on finding one that doesn’t sleep hot! In other words, on that’s temperature neutral. Foam, especially memory foam, softens when it gets warm. Then you sink in, it traps your body heat and the temperature rises. Generally speaking, the softer or more plush or the more memory foam you have, the hotter you’ll sleep. Even people who normally sleep cold will find themselves getting sweaty. Best Mattress to Sleep Cool? We know this isn’t a comprehensive test but Consumer Reports came out with a list of the mattresses that trapped the least body heat. One of them is an Unbox Mattress top pick – Purple! As Purple states on their website: Most mattresses don’t breathe. Memory foam, latex, even foam with “cooling” gel beads are hot because there is no place for air to flow. These materials are either completely solid or have very small airways that allow for little ventilation. Consumer Reports put a copper plate on a mattress in a temperature-controlled room. “The plate is insulated on all sides except the one that comes in contact with the mattress. Then we run an electrical current through the plate”. Then they measured how much energy the copper plate uses to maintain a temperature of 98.6 degrees Fahrenheit (close to people’s average body temperature). The 10 hour test looked at how much energy was used. Consumer Reports also looked at the worst performers – the mattresses that slept the warmest. Stay away from them if you want to sleep cool! 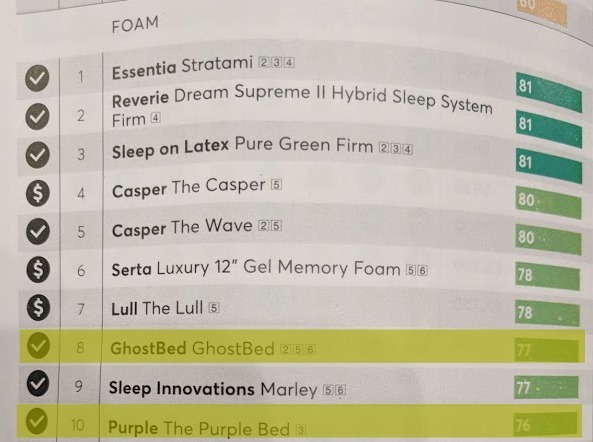 It’s interesting that Sleep Number beds made both lists! That just goes to show that materials used makes a big difference! Also note that no boxed brands made the list (even though boxed brands are usually all foam). What materials should you avoid if you want to sleep cool? Foam. Is your mattress too hot? It might be time to switch. Let us know if you’ve ever found a cooling mattress that works! Enter your email address to subscribe & we'll send you new posts. Unbox Mattress is a participant in the Amazon Services LLC Associates Program, an affiliate advertising program designed to provide a means for sites to earn advertising fees by advertising and linking to Amazon.com.